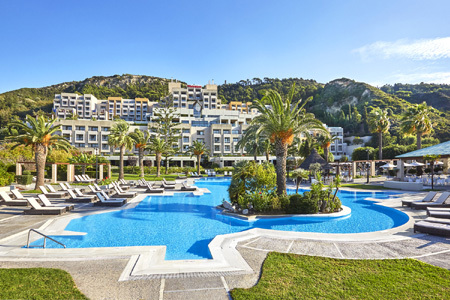 Sheraton Rhodes Resort is located on the island of Rhodes, only a few kilometers from the medieval town of Rhodes, a UNESCO he ri tage site and few steps from a pri stine beach. Rhodes Island is full of monuments, historical or na tural, attractions and venues for you to enjoy a unique stay, most of them just a few kilometers from Sheraton Rhodes Resort. 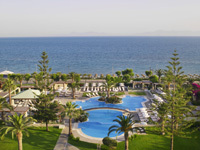 The Sheraton Rhodes Resort offers 401 spacious guestrooms and suites with a variety of garden or sea views. All rooms have been refur - bished and feature the “Sheraton Sweet Sleeper” beds - A plush mat - tress, finest qua li ty li nen, cozy duvet, and plenty of comfy pillows. In room facilities: Flat screen LCD tele vi sion 32’’, individually cont rolled air con di tioning, electronic safe box (laptop - sized), coffee & tea fa cilit - ies, bathrobes & slippers, branded bath room amenities, hair dryer, beach towels, DVD player (upon request), Wi-Fi internet con nect ion (with extra charge). 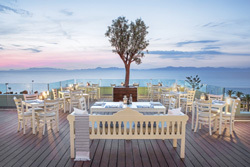 Sheraton Rhodes Resort offers a host of dining options sure to please every taste. Select from one of our four restaurants, the pool bar or the lounge bar and let our renowned barmen entice you with a tantalizing cocktail while you enjoy spectacular Aegean sun sets. A great range of facilities is avail able at the resort: private beach, 3 out - door pools, 1 indoor heated pool, health club, fitness 24h/24h, tennis court, 2 squash courts, basket ball, volleyball, water sport centre, kid’s club. 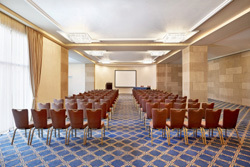 The Sheraton Rhodes Resort has a selection of multi-purpose funct ion spaces including an Imperial Ball - room and 14 meeting rooms which vary in size, offering a total Con fe - rencing area of 2500 square meters. We are able to accom mo date up to 650 dele gates for a Con ference and up to 800 guests for a banquet. Our facilities offer na tural daylight, wire - less internet through out our meeting spaces, a fully ope ra tional business center and "the Link at Sheraton" where guests of the hotel may check their e mails in com fortable sur - round ings at no ad di tional charge. Whether planning a conference or a social event, our professional staff is on hand to support and guide you on the journey to a very successful event.